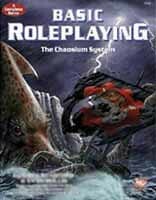 Basic Roleplaying Central is the community fansite for Chaosium's Basic Roleplaying game system and related RPG systems! OSRIC emulates game rules from advanced first edition fantasy games (1e) of the 80s. GORE emulates popular percentile-based systems from the 80s through the present day. Labyrinth Lord gets "back to the basics" by emulating game rules from simple fantasy games of the late 70s and early 80s. Mutant Future is based on the Labyrinth Lord system, but is retooled in the spirit of classic nuclear post-apocalypse science fantasy games.